When Facebook recently introduced new search features, many users were alarmed to discover the website is already recording every search they make. Those searches remain private, but just imagine if they became public. Now imagine they were your Google searches. Now imagine they were the Google searches of Justin Trudeau, Thomas Mulcair and Stephen Harper. 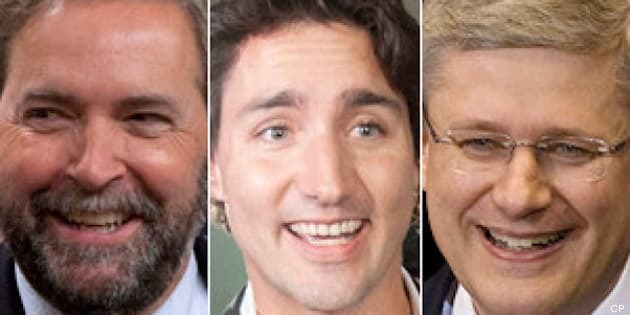 Now you have the idea behind three of the funniest satirical Twitter accounts in the short history of Canadian politics on the web. Tweets from @TrudeauGoogles, @MulcairGoogles and HarperGoogles have become a common sight for those perusing Twitter for info on what's happening on Parliament Hill. They offer a funny, but often revealing take, on the happenings of the day. While the man behind all three accounts wishes to remain anonymous, he told HuffPost Canada he was motivated to create the accounts by the boredom he experienced reading Canadian politicians' "partisan" posts. "The vast majority of active politicians and party stalwarts are notoriously frustrating to follow, clogging feeds with photo-op plugs, talking points and ubiquitous policy documents," he said in an email. "I wanted a way to monitor how each of the three major parties was adapting to new forms of political communication without having to follow them on my personal feed." The 'aha' moment came while looking at the search history on his smartphone. "What we search represents short, succinct records of our daily concerns, challenges and insecurities. This seemed a perfect conceit for political parody on Twitter." The imaginary searches divide into two categories: those that react to the news of the day and those built around the more humorous aspects of the politicians' personalities. Mulcair is "obsessed with beards and the colour orange. Harper searches disproportionally about cats. For Trudeau, consistent themes are hair and a good-hearted obliviousness to privilege." You can see some of the funniest tweets from all three accounts in the slideshow below. The accounts offer a biting take on the issues of the day, but the creator said he aims to keep things "light-hearted." "No cheap personal attacks, no presumptions of racism or misogyny and sensitivity towards serious matters of crisis or outrage," he said. "Ideally, TrudeauGoogles would be an account that Mr Trudeau himself might get a few chuckles from." The strategy has attracted plenty of attention, especially the Trudeau account, which has gained nearly 2,000 followers in roughly four months. It's no @AngiesRightLeg, but still pretty impressive for an account devoted to the minutia of federal politics. "I'd argue that the reason the Trudeau account is so much more popular than Harper's is that the content of @TrudeauGoogles seems to appeal to a wider range of Twitter users," he said. "Regardless of your opinion of him personally, there is no doubt that Mr. Trudeau is capturing the attention of social media in a way that no Canadian politician has." As for Trudeau's actual social media presence, the man behind the fake account isn't as smitten as some. "I think one of the surprises in the Liberal leadership race so far has been how underwhelmingly Mr. Trudeau has used his presumed advantage in the social media sphere. He has huge and unique opportunities to build populist infrastructure online ahead of his federal campaign, but has yet to live up to that potential." Harper, on the other hand, has radically improved his social media game since the last election, he said, pointing to the recent success of the prime minister's #dayinthelife tweets. As for whether any other politicians will be getting the Google treatment, he said he's already experimenting with @ObamaGoogles (but can't quite get the voice right) and thinks Ontario Progressive Conservative Leader Tim Hudak would "work really well."